Kambili and her brother Jaja live in Nigeria with their mother and their very strict Catholic father. Kambili's life is ruled by rigid schedules, high academic expectations, and the fear of disappointing her father. Even Kambili's mother is not spared from their father's swift and unmerciful punishments. Amidst growing political unrest, Kambili and Jaja go to stay with their Aunt Ifeoma, where they can relax and act a little more like regular teenagers. As she begins to feel more comfortable with this way of life, Kambili finds herself feeling torn between two very different parts of her family. Kambili's father, Eugene, was especially well crafted. Though he was undeniably abusive, he was also well-respected in the community and for good reason. His generosity towards those less fortunate was genuine, and I always felt that even his misguided behavior towards his family was rooted in a desire to do what was right, primarily stemming from his strong religious beliefs. The abuse was painful to read about and I knew this situation had to come to a head somehow, but it did so in a way I did not expect. Kambili's immediate family differed from her aunt's family not just in the religious strictness, but also in their wealth. Her aunt's family isn't nearly as well off, and Amaka is quite bitter about what she views as Kambili's glamorous life. I liked this tension between Kambili and Amaka and the way it was transformed through a better understanding of each other. Sometimes my experience with a book is affect by external factors and this was unfortunately one of those times. It took me about five days to read the first 100 pages because I was so distracted by other things, but once I finally got into it I read the other 200 pages in one day. Perhaps I would have liked it more had I been more focused, but I still don't think it compares to Adichie's other two novels. However, she has created characters who feel authentic and relatable, and captured the sights and smells and tastes of Nigeria. Her ability to bring me into this totally different world is what I love most about her writing and Purple Hibiscus certainly succeeds on this front. 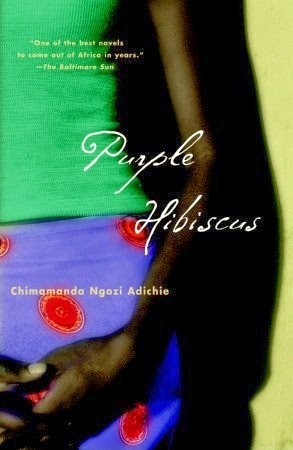 This is actually my favourite Adichie. It isn't as polished as the other two, but I found that rawness more moving. I liked the way she focused on a smaller number of characters and kept the plot tighter. Perhaps I love it because I tried it first? After reading her other books you were probably prepared for a much higher writing quality? Part of may be because of how sophisticated and polished her more recent books are. I also think I may have liked it more had I read it at a different time. But I still enjoyed it! I agree this book is less sophisticated than Yellow Sun & Americanah, but it's actually my favourite Adichie too. I think I felt more emotional connection with the characters when I read this one. I can see why - we are so close to Kambili in the story and her family situation is emotionally intense.